I’ve blogged a bit before about talking myself out of things and the art of failing. It’s something I have to keep telling myself about because even when I believe it I second guess myself. The basic idea boils down to this: stop worrying about it and do it, you might fail, in fact you probably will, but that is good because then you get to try again. The bigger idea is that we all have a whole bunch of bad ideas and a few really good ones, and the more of the bad ones we get out of the way the sooner we get to the good ones. Some people never try any of them because they are afraid of failing. The point of this is to embrace the fails as a needed step towards the wins. A good example of that is this shirt. 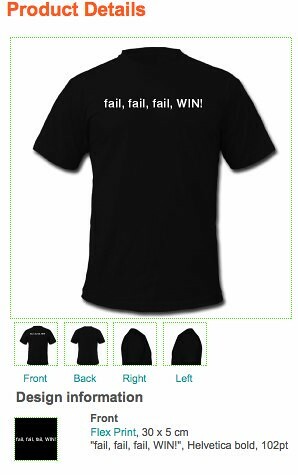 Fail, fail, fail, WIN! It’s a slogan I’ve had in my head for a while and I thought I’d make a shirt with it. The other day I finally did, and then when I was done I scrapped the idea. I thought it wasn’t strong enough to stand on it’s own. I thought it wouldn’t make enough sense. I told myself it was stupid. Then I mentioned it in passing to some friends on the Crash Space mailing list and people liked it. In fact one said it was epic. Epic! Then I read this great post on Wil’s site about getting excited and making things. And I realized what I’d done. I’d made something and then talked myself out of it. So I decided to correct that and put the shirts online. Actually, shirts, stickers, and even SIGG water bottles. You can order them from this Cafe Press shop or this Spreadshirt shop, though Cafe Press has more options. I don’t know yet if this is a win or a fail, but it’s something at least. And that’s good enough for me.